Once again, Creative has used its proprietary Silencer technology and lunched the iPod Docking Station D-10 and X-30 silently. Though these ain't any new products, it was only available in the US in the past. 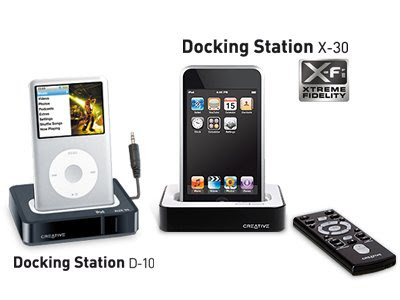 iPod owners can get the Docking Station D-10 for $79 which allows you to hook up your iPod to a speaker system or the Docking Station X-30 for $119 which allows you to enhance your songs with X-Fi and hook your iPod up to a TV. The only disappointment here again is the lack of support for the iPhone. Get your docking stations now at the Creative Stores at Plaza Singapura and International Business Park Creative HQ!